Birds of the Heath: Why? A recent post, in which I mentioned having glimpsed a possible Pine Marten (in a region of the Brecks where I am reliably informed a few may have been released) prompted a not entirely unexpected - but completely unwarranted - abusive tirade from an anonymous correspondent. 1) Any misidentifications I make on here are genuinely accidental: I have never claimed to be an expert on the finer points of classification of obscure bird subspecies. I am fortunate enough to have been an active birdwatcher for over fifty years: as a result I've seen lots of species that our little anonymous chum can only dream of: Sociable Plover, Pacific Swift, Little Whimbrel, three species of Pratincole, Redhead, Canvasback, Naumann's Thrush etc etc. 2) The meteorites I sell are not 'pebbles from Cley Beach': I am a former Fellow of the Royal Astronomical Society, and a charter member of the IMCA and my stock carries full provenance and attribution. I obtain my meteorites from impeccable sources all around the world and have had two well-received books published on the subject. 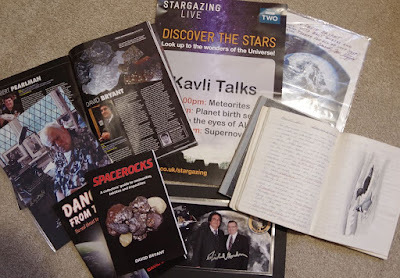 My meteorites have appeared on TV in the hands of Sir Patrick Moore, Dr Brian Cox and Dara o' Briain among others and have been purchased by universities, schools and colleges all over the world. 3) Over the years I have been fortunate enough to have met many well-known personalities: astronauts, astronomers, musicians, actors, pilots and so on. These encounters have occurred as a result of my various business enterprises, lectures, media appearances and writing. I look forward to a response from Mr Anonymous telling us all what - if anything - he's managed to achieve in life so far: if he tells us his name (and provides proof of his identity!) I'll publish it on this blog! Very Sad David, there are always those who are quick to deny these things and aggravate situations - they must be having issues with the hormone monster!